MANILA, Philippines -- A global pressure campaign on North Korea propelled by sharp new U.N. sanctions received a welcome boost Sunday from China, the North's economic lifeline, as Beijing called on the pariah nation to halt its missile and nuclear tests. The Trump administration cautiously embraced China's apparent newfound cooperation, while putting it on notice that the U.S. would be watching closely to ensure it didn't ease up on Pyongyang if and when the world's attention is diverted elsewhere. But there were no signs the U.S. would acquiesce to China's call for a quick return to negotiations. The diplomatic wrangling sought to build on the sweeping new North Korea sanctions passed by the U.N. Security Council a day earlier -- the strongest in a generation, the U.S. said. As diplomats gathered in the Philippines for an annual regional meeting, President Donald Trump was cheering the move from afar. He touted the "very big financial impact" of the sanctions and noted optimistically that both China and Russia had joined in the unanimous vote. "It was a good outcome," U.S. Secretary of State Rex Tillerson said in characteristically understated fashion as he met with South Korea's top diplomat. For the U.S., it was a long-awaited sign of progress for Mr. Trump's strategy of trying to enlist Beijing's help to squeeze Pyongyang diplomatically and economically. Chinese Foreign Minister Wang Yi, meeting with North Korea's top diplomat during the gathering in Manila, urged the North to "maintain calm" despite the U.N. vote. "Do not violate the U.N.'s decision or provoke international society's goodwill by conducting missile launching or nuclear tests," Wang said, in an unusually direct admonition. Though Beijing repeated its call for the United States and North Korea to resume talks, the U.S. said that was still premature, and rejected yet again a Chinese call for the U.S. to freeze joint military exercises with South Korea in exchange for the North halting nuclear development. Pyongyang views the military exercises as rehearsals for an invasion. The U.S. also warned it planned to rigorously monitor China's compliance with the new penalties. Susan Thornton, the top U.S. diplomat for Asia, said Beijing had historically cooperated with sanctions after flagrant North Korean violations but then slipped back over time. "We want to make sure China is continuing to implement fully the sanctions regime," Thornton told reporters in Manila. "Not this kind of episodic back and forth that we've seen." Infusing the diplomatic gathering with dramatic intrigue was the presence of Ri Yong Ho, North Korea's foreign minister, the odd man out at a meeting dominated by concerns about his nation's nuclear proliferation. Indeed, the U.S. was floating a proposal to temporarily kick North Korea out of the 27-member Association of Southeast Asian Nations Regional Forum, although other member nations are divided about that idea. Would Tillerson trade pleasantries with his North Korean counterpart as they cross paths at the regional gathering, or potentially even sit for a meeting? It was a question driving the hallway chatter at the gathering, but the U.S. summarily shot down the prospect. Though Tillerson has emphasized the Trump administration's willingness to sit down with North Korea for negotiations, he's said that won't happen until the North agrees to abandon its nuclear aspirations. Even with new U.N. sanctions in place intended to drive Pyongyang back to the table, conditions still aren't ripe for talks, U.S. diplomats said. But Wang, the Chinese envoy, cast the North Korean foreign minister's presence in Manila as a positive, enabling him to "hear the voices from other sides." Speaking in Chinese, Wang said that Ri "also has the right to share his opinions." The North Korean envoy hasn't spoken publicly since arriving in the Philippines. But a commentary in the ruling party's Rodong Sinmun newspaper said Washington had disregarded the warning the North sent with its intercontinental ballistic missile tests and was pursuing "desperate efforts" in the form of stepped-up sanctions. "Now the U.S. mainland is on the crossroads of life and death," the commentary warned. The new sanctions could cut off roughly one-third of North Korea's estimated $3 billion in annual exports, ostensibly denying the nation of funds for its weapons programs. All countries are now banned from importing North Korean coal, iron, lead and seafood products, and from letting in more North Korean laborers whose remittances help fund Kim Jong Un's regime. All 15 member nations on the U.N. Security Council voted to adopt the new round of sanctions Saturday afternoon. U.S. Ambassador to the U.N. Nikki Haley said the vote showed that the Security Council came together to put North Korean leader Kim Jong Un "on notice" by "matching its words with actions." "North Korea's irresponsible and careless acts have just proved to be quite costly to the regime," Haley said after the successful vote. She hailed the resolution as the "single largest economic sanctions package ever leveled against the North Korean regime." 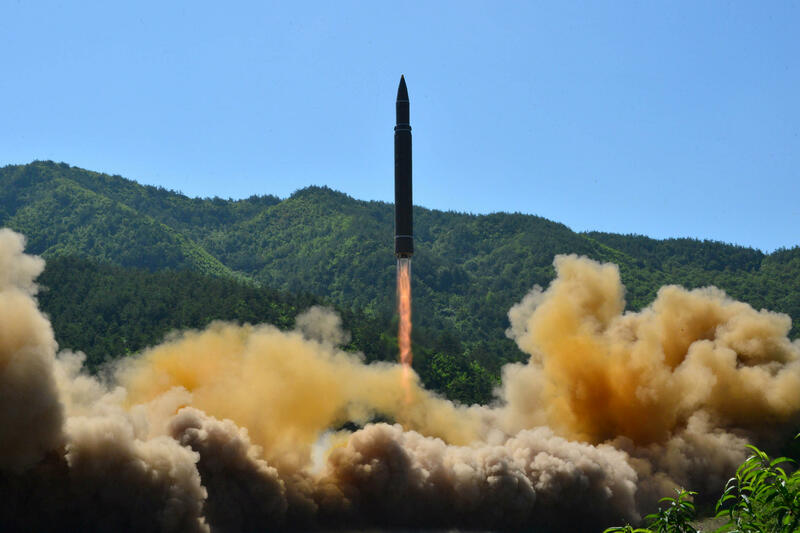 The U.S. drafted the sanctions resolution and negotiated it with China following North Korea's unprecedented test of an ICBM in July and a follow-up test weeks later. Those tests sharply escalated U.S. fears that Pyongyang is a key step closer to mastering the technology needed to strike American soil with a nuclear-tipped missile. The first test of the ICBM, on July 4, "changed the game," CBS News senior national security analyst Fran Townsend said last month on "CBS This Morning." Despite deeming North Korea a top security threat, the young Trump administration has struggled to find a strategy that differs significantly from what the U.S. has tried in the past. Aside from calling for more sanctions, Mr. Trump's approach has centered on enlisting China -- the North's biggest trading partner -- and others to lessen ties to Pyongyang. Mr. Trump's initial optimism about China's willingness to help gave way to public exasperation, with Mr. Trump saying Chinese President Xi Jinping had "tried" but that it "has not worked out." Trump's administration began floating potential plans to punish China for its trade practices in what was widely perceived as a reaction to China's inaction on North Korea. But in recent days, the two powers have started to paper over some of those differences. Beijing praised Tillerson for declaring the U.S. wasn't seeking regime change in North Korea. Trump has held off, for now, on the trade actions. And China joined the 15-0 vote in the Security Council on Saturday on the new sanctions. "Who has been carrying out the U.N. Security Council resolutions concerning North Korea? It is China," Wang, the Chinese foreign minister, said Sunday. "Who bore the cost? It is also China."